Notes: Freshman Fuels QU - College Hockey, Inc.
Tufto leads Bobcats into first-round series with local rival Yale. Odeen Tufto’s 14 multiple-point games match Jack Eichel’s output as a freshman in 2014-15. The first-round playoff series feature some compelling matchups including 2013 NCAA championship game rematch between local rivals Quinnipiac and Yale. 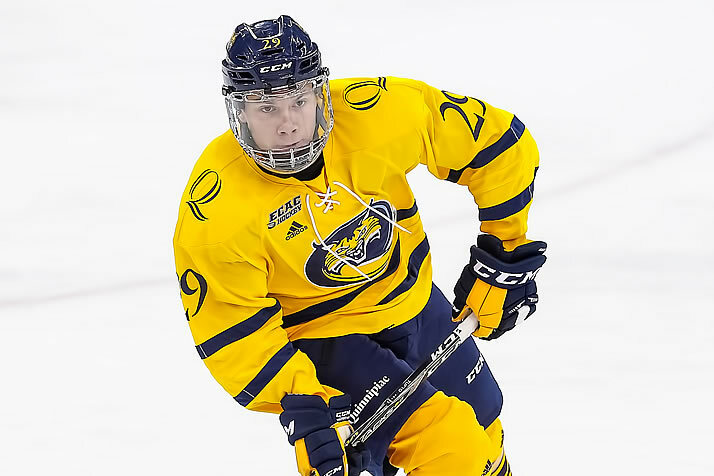 The Bobcats make the short trip to New Haven led by the nation’s top freshman scorer, Odeen Tufto (Chaska, Minn./Sioux City-USHL), one of five rookies to lead his team in points. Tufto has only been held off the scoresheet in consecutive games once, and his 14 multiple-point games tie Jack Eichel for the most by a freshman in the last six years. USAHockey.com: What’s next? | Q&A with Mike Snee, College Hockey Inc.
AIC’s European influence – American International will host a playoff game for the first time in its Division I history, as the Yellow Jackets welcome Niagara to Springfield, Mass. The Yellow Jackets and second-year head coach Eric Lang have been bolstered by significant contributions from Europeans, with an NCAA-leading 10 players from six European countries on the roster. That’s part of a growing non-North American influence in Division I that has hit an all-time high in 2017-18. UMass young guns – Picked last in Hockey East, Massachusetts will host a first-round playoff series thanks to a 4-1-1 record down the stretch. Five freshmen sit atop the Minutemen scoring chart, led by local product John Leonard (Amherst, Mass./Green Bay-USHL). Leonard grew up a UMass fan, cheering on the team while his father, John, was an assistant men’s basketball coach at the school. He heads a freshman class that has produced 144 points, 30% more than any other team’s rookies. Saturday’s Stadium Series game at the U.S. Naval Academy is the third NHL outdoor game to be held on a college campus and the first of those at a venue that hadn’t previously hosted an NCAA outdoor game. The 2014 Winter Classic was held at Michigan Stadium and in 2016 Minnesota’s TCF Bank Stadium hosted a Stadium Series game. Next year’s Winter Classic is scheduled for Notre Dame Stadium. USA Hockey celebrates the 11th annual Hockey Weekend Across America this weekend … Eleven teams have hit 20 wins this season; of those, only Minnesota State (six straight years), Providence (five) and Bowling Green (four) have reached 20 wins in more than two consecutive seasons … Atlantic Hockey, ECAC Hockey and Hockey East each have two teams hosting playoff series that did not host last season (AIC, Holy Cross, Colgate, Dartmouth, Massachusetts and Maine).